Kitwe is the second largest city in terms of size and population in Zambia which was founded in 1936 and owes much of its commercial and industrial development to the nearby copper mines. It is located in the Copperbelt Province adjacent to the Democratic Republic of Congo. It appears that the flag is an armorial banner based on the shield of the arms originally granted under Letters Patent by the English King of Arms on 20 July 1954. 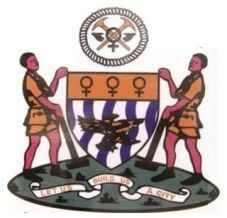 Arms featuring a new crest, supporters and more modern English translation of the motto (originally Vente Urbem Nobis Aedificaemus - Come Let Us Build a City) are shown above. The original shield has been retained and comprises blue and white wavy pallets superimposed on which is an African Fish Eagle, which were taken from the arms of Northern Rhodesia (and retained in the arms of Zambia) above which are three ancient signs for copper in black on a light brown background. A completely different design featured on a Zambian postage stamp which was issued in 1987.